The 4th Annual CURATORIAL SLAM! What Is Curatorial Work Today? 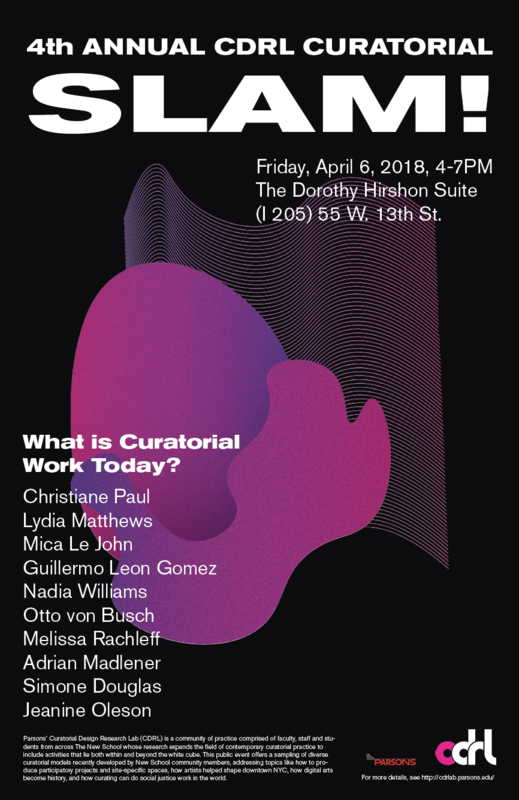 Parsons’ Curatorial Design Research Lab (CDRL) is a community of practice comprised of faculty, staff and students from across The New School whose research expands the field of contemporary curatorial practice to include activities that lie both within and beyond the white cube. CDRL is proud to host its 4th Annual CURATORIAL SLAM!, a lively array of fast paced ideas and images mixed with drinks and delectables. These 8 minute Pecha Kucha-style presentations will reveal how New School community members have crafted recent curatorial projects to explore how curatorial work can function in both local and global arenas. Curating a variety of artists’ projects in concrete wheat silos for the Auckland Festival, Simone’s exhibition speculates on the timely question of What is home? If home is not understood as a fixed space, how might it be interpreted as a shape-shifter, revealed through time, culture, and politics? Port to Port, a nomadic curatorial research program Guillermo co-founded in 2015, grounds theories of planetary urbanization and contemporary capitalism by focusing on maritime logistic cities and collaborating with local institutions to co-produce exhibitions and artist residencies. How does an independent, NY-based curator collaborate with the directors of a 19th Century Silk Museum in Tbilisi, Georgia, to call attention to and re-assert the multidisciplinary cultural value of an under-celebrated local “wunderkammer”? This presentation will explore the process of making site-specific (and responsive) education programs for youth in underserved communities, including an overview of a program Mica created as part of No Longer Empty’s new signature teen programs in East Flatbush, Brooklyn. In an era which challenges our existing tools of resistance, the curators, all women of color Parsons alumni, felt an urgency to hold space to feature powerful examples of creative practices that explore the lived experience of race, and which work towards dismantling systems of racism. How can an exhibition continue to function both as an action and an invitation? Jeanine will discuss the collaborative project between incarcerated people held in solitary confinement, artists/photographers, and the organizers, who also use this work—as well as its current curatorial platforms–to support advocacy efforts to end the practice of solitary. Adrian’s presentation focuses on the role that material culture studies may be able to play in a socio-political environment of heated debate and misinformation. What are the challenges of translating a graduate seminar on this topic, offered by Dr. Glenn Adamson in Fall 2016, into an engaging and accessible exhibition that is aimed at a much broader public? Wilhelm Reich taught at The New School in 1940, theorizing how our psyches are caught between bio-electrical energies of the body and social currents, between freedom and fear, sexuality and fascism. Otto’s project transforms the gallery into a laboratory to explore how Reich’s ideas may used in designing fashion today. What changes about our understanding of culture when artist perspectives are the starting point? Melissa discusses the value of primary sources and their impact on her exhibit/ book on artist-run galleries of the 1950s/ early 1960s, which resulted in a more inclusive portrayal of the era. Opening at the Whitney Museum in Sept. 2018, “Programmed” features works from the museum’s collection created between 1957 – 2016, and weaves conceptual and computational projects, as well as video works into a matrix that illuminates how programs, from analog to digital, have informed and connected artistic practices over the decades.